Justė Janulytė’s music is recognisable by long, slow expositions, gradual enrichment of texture; thanks to her relished canon technique large sound layers create impression of twinkling, rippling, flashes of light and colour. The music as if emerges from unseen distances and gets closer to the listener without notice, then finally pierces into the listener, passes through all the cells, moves the atoms, and then slowly recedes until disappearing completely in the horizon. Sometimes it seems that Justė’s works do not have a beginning or an end and that over there, behind the horizon, the music keeps on moving, pierces someone else. Justė’s music raises associations not with sound images but rather with the substance which is moving in space and has its temperature, light and density. Such substance-like quality of music is effective to the listener: even when hearing the piece for the first time you can identify in which section of the piece you are, where the mass of sound is moving to. This quasi-physical contact is an essential feature of the reception of Justė’s music. who has traced the abyss of July night, how many miles does it take to dart downwards to the hollow, where nothing else happens...? Justė Janulytė (b. 1982) studied piano, choral conducting, music theory and composition (with Prof. Bronius Kutavičius) at the M. K. Čiurlionis School of Arts. 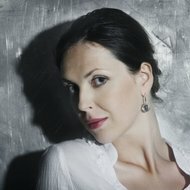 In 2004 she was awarded a Bachelor's degree from the Lithuanian Academy of Music and Theatre, where she studied composition with Prof. Osvaldas Balakauskas and music theory with Prof. Gražina Daunoravičienė; in 2006 she completed her studies for a Master's degree in composition at the Lithuanian Academy of Music and Theatre. In 2004-05 Justė Janulytė studied at the Milan G. Verdi Conservatory. She has also taken part in the master classes for young composers of Baltic countries in Dundaga (2002, Latvia), international workshop for composers and musicologists in Warsaw (2003), Helena Tulve's composition master class in Tallinn (2006), Luca Francesconi's "Earlab" in Stresa (2006, Italy). Janulytė's music was performed in Europe, USA and Canada, by Lithuanian National Symphony, Teatro La Fenice Symphony and Gothenburg Symphony Orchestras, French Flute, Lithuanian Chamber and St. Christopher Chamber orchestras, Riga Sinfonietta, Birmingham Contemporary Music Group, Ensemble Bit20 (Norway), Estonian Philharmonic and Danian Radio chamber choirs, Lithuanian Flute Quartet, Chordos and Kaunas string quartets, Quasar (Montreal) and Xasax (Paris) saxophone quartets, Rūta and Zbignevas Ibelhauptas piano duo, cellists Anton Lukoszevieze (England) and Francesco Dillon (Italy), and others. Her works were included in the programs of such festivals as World New Music Days (Sweden, 2009), Venice Biennale (Italy, 2008), Huddersfield Contemporary Music Festival (England, 2008, 2010), MaerzMusik (Germany, 2011), Holland Festival (the Netherlands, 2011), Warsaw Autumn (Poland, 2011), Gaida (Lithuania, 2005, 2007, 2011), Jauna Muzika (Lithuania, 2007, 2009), and many others. She has taught the course on contemporary music language at the Lithuanian Academy of Music and Theatre. The composer has also written critics and articles on music. Justė Janulytė first came into public view in 2004 when her graduation work white music for 15 strings was awarded as the best chamber piece at the competition organized by the Lithuanian Composers' Union. Consecutively, she has won the prize for the best orchestral work (textile, 2008), the prize for the best chamber work (Elongation of Nights, 2010), and the Grand Prix (Sandglasses, 2011) at the same competition. In 2009 she also became a winner in the young composers category at the UNESCO's International Rostrum of Composers in Paris (with aquarelle for mixed choir). Within the span of several years her experimental and highly visionary works have earned her wide internal reknown and official recognition at home, in the form of the Young Artist's Prize awarded by the Lithuanian Ministry of Culture in 2011. In 2017 the composer was awarded Lithuanian National Arts and Culture Prize, the highest artistic distinction in Lithuania. Majority of her works, written for 'monochromatic' ensembles (e.g. 4 flutes or saxophones, 21 strings, etc. ), represent slow metamorphoses of textural, dynamic, timbral and ornamental gestures. While balancing between the aesthetics of minimalism and sonorism, Justė Janulytė composes acoustic metaphors of optic ideas (Pendulums, 2001; Elongation of Nights, 2009; textile, 2008; aquarelle, 2007; Silence of the Falling Snow, 2006, etc) and researches the visual nature of musical phenomena in the works where sound and image are fused together (Sandglasses for video, live electronics and installation of video and lights, 2010; Breathing Music for 4 cellos, live electronics and kinetic sculptures, 2007; Eclissi for violin, viola, cello, double bass, live electronics and soundproof glass installation, 2007).